Several times every year we buy directly in the regions of origin, inter alia in the districts of Tabriz, Nain, Shiraz, Bijar and Meshed. Therefore we are on friendly terms with the merchants of the still traditional-minded bazaars and our relationships are often extending over more than one generation. 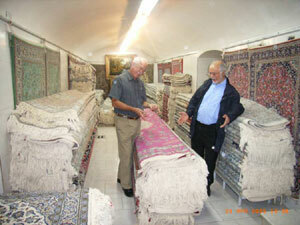 On the following pages we are presenting you with a selection of our most beautiful carpets.